Length of employment: Varies by base, but in general April 20 to September 15. Pre and Post season extensions are not uncommon, as they will be direct result of the fire danger levels during these shoulder seasons. The Airtanker Base Supervisor reports to a designated Wildfire Ranger in the Area and is responsible for safe and efficient operation of one of the 14 Airtanker Bases located around the province. This position facilitates the fuelling, dispatching and loading of the provinces airtanker fleet in the suppression of wildfires. The supervisor is responsible to maintain inventories of fuel, retardant, and water, and the supervision of contract loader personnel. This position requires excellent supervision, communication and organizational skills. The ability to prioritize, multi task, and a commitment to work long hours when required. Aptitude with computers, various standard and custom software programs. High school diploma plus some related experience (i.e. up to 12 months). Equivalency: Directly related experience or education considered on the basis of: one year of experience for one year of education or one year of education for one year of experience. Experience in Microsoft Office, specifically: Word, Outlook and Excel. Highly organized individual with previous supervision, communication skills. Preference will go to applicants who have prior experience with loading Airtankers. Completion of a fitness test may be a requirement of this position. All work preformed will be conducted in a safe manner. All accidents, incidents, and near misses will be reported. Ensure the required safety station equipment is on site, maintained, marked and spotted at strategic locations. Ensure the adherence to Standard Operating Procedures as dictated by the department. Lockout unsafe or defective equipment. Conduct safety orientations for all personnel entering the base. Maintain the Safety library in a neat and orderly condition. Supervision of Contract Loader personnel as assigned to the base. Ensure Contract Loaders are given daily briefings as to the operational plan for the day. Review problems and correct deficiencies with Contract Loader. Provide mentoring to Contract Loader. Conduct facility and grounds maintenance as required. Conduct workshop maintenance and clean up. Housekeeping of operations building as required. Perform general maintenance on AAF equipment assigned to the base. Ensure contract loaders are maintaining contract supplied equipment as dictated in the contract. Liaise and work with the Air Attack Officer who is assigned to an airtanker group when assigned to your base. Ensure group receives briefings as required upon arrival. Facilitate the requirements of the airtanker group. I.e. aircraft spares storage, assisting in setting up accommodations, and vehicle rentals as needed, etc. Dispatching of airtanker groups, as requested by the area duty officer. This includes alerting the group personnel and the passing of location, bearing/distance, and other related information. Maintaining information on aircraft roll times, volumes and quality of retardants/foams loaded on aircraft. Ensure that the fire retardant mixing facilities and equipment are in operational condition at all times. Ensure there is adequate supply of foam, retardant and water to support normal operations. Ordering and tracking of supplies as required, maintaining minimum inventory levels. Before stand-to make a visual inspection of the fire retardant mixing facilities on the ATB to verify that all equipment is ready. Ensure the loading area itself is being properly maintained, clean, and is in a safe condition. Ensure that the material, supplies, and equipment are not placed or stored in locations that may interfere with the fuelling or fire retardant loading procedures. Ensure that proper procedures are followed while approaching and loading aircraft. Ensure testing and circulation of retardant is preformed as per policy. Maintain records of the amount of fire retardant used, and stored. Ensure there is a sufficient supply of fuel and oil available to operate the aircraft assigned to the airtanker base. Ensure fuel quality testing is done as per standard operating procedures. Lockout and report any contaminated fuel. Document all fuel tests results. Ensure fuel spills are reported and cleaned up using appropriate methods and procedures. Ensure weather, situational reports, airtanker deployments/alerts, areas daily safety briefing, and other relative information is obtained and posted daily. Maintain an inventory and be accountable for all signed out equipment. Assist in Staff and Public Tours of the Airtanker Base. How many hours are in a typical work week? The typical work week is 36.25 hours (7.25 hours/day). You will be required to work overtime as required by the current wildfire danger level. What kind of schedule would I be on? Schedules between Areas will vary however you can generally expect to work 10/4 schedule. Are there living accommodations available? In most Areas living accommodations can be provided. Please contact the Area directly for type and availability. Do I require a vehicle? A vehicle is not required however it is your responsibility to obtain transportation to and from work. While a working vehicle will be available to perform work related duties. Successful completion of defensive driving is required to operate a Department vehicle. Both on-the-job and specific software training will be provided. Candidates will be required to attend and pass a one week Airtanker Base Supervisor course which will be held during the last part of April. Am I expected to participate in the field on wildfires? Primarily you will be working at an assigned base located at the local airport. 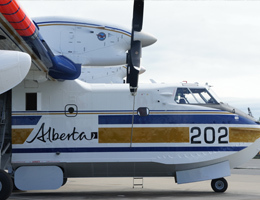 However, depending on the level of active air operations in the province at any given time, individuals may be asked to relieve other airtanker base supervisors in another location, and also there are sometimes requirements for experienced base supervisors to work on temporary bases set up at various locations around the province. This may also include mobile retardant bases set up to facilitate helicopter retardant bucketing operations. Disclaimer: This web page was built using information believed to be accurate at the time of construction and is for information purposes only. For specifics on the job position, please contact the location/person in charge of the position you wish to apply for.